So this friend of mine, Michael, has quite a passion for beers from North Carolina. So much so that he's working on a business to promote them and make sure everyone has the opportunity to taste them. Today, he's doing a guest post for me of a beer and brewery that I've never crossed paths with. Sounds awesome! Sisters of The Moon American I.P.A. 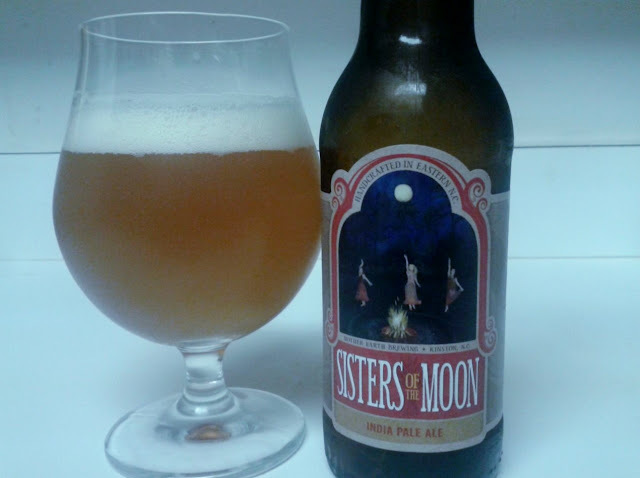 This beer is crafted by Mother Earth Brewing in Kinston, North Carolina. 6.8% ABV. This beer pours with a slight haze and a half inch head. Floral and citrus aromas hit the nose right away. Notes of honey and lemon are apparent on the palate followed by appropriate hop bitterness. The bitterness is aggressive, but not overly so, exactly what you would like from a well made I.P.A. This is a really well made beer by one of North Carolina's hottest breweries. I have had the opportunity to enjoy this beer both by bottle as well as on draft and it always satisfies. While I appreciate over the top hops as much as anyone I can also appreciate that this I.P.A. is well balanced enough to be considered sessionable. Labels: IPA, kinston, mother earth, ncbrew2u, north carolina, Sisters of The Moon American I.P.A.